Erdogan Speech Triggers Physical Confrontations At Turkish-American Event In NYC : The Two-Way As security personnel grappled with protesters, Turkish President Recep Tayyip Erdogan paused onstage before blaming the interruption on "a few impertinent hall terrorists." Turkey's President Recep Tayyip Erdogan addresses a Turkish-American meeting in New York, Thursday. Protesters disrupted his speech before being ejected from the hall. Protesters were forcibly ejected from a speech by Turkish President Recep Tayyip Erdogan in New York City on Thursday, in the latest U.S. confrontation involving protests against Turkey's leader. Erdogan was speaking to an audience at the Marriott Marquis hotel in Times Square when, as the AP reports, someone shouted "Terrorist!" As shouting continued and security personnel grappled with protesters, Erdogan paused onstage before blaming the interruption on "a few impertinent hall terrorists." The protesters were eventually forced out of the event — but not before being roughed up. The violence was captured on video by people who were at the event as well as news agencies that were covering Erdogan's speech. Footage posted by Voice of America's Turkish agency shows groups of men in suits forcing people out of the hall — and in at least two cases, protesters were hit in the head while being held. "It was unclear whether the men in suits who ejected the demonstrator from the hall were U.S. Secret Service agents, private security guards hired for the event or members of Erdogan's security detail. But it did not appear that Turkish security officials were involved, the U.S. Department of State said." The video also shows that members of the audience took swipes at the protesters as they were being taken out, striking out at them with their hands and with small Turkish flags that were supported by plastic rods. Erdogan has been in New York to attend this week's session of the U.N. General Assembly. He was speaking Thursday at an event held by the Turkish American National Steering Committee. "My dear friends, I have a request to you," Erdogan said as he sought to focus attention back onto the stage. "Let's not give this beautiful gathering to a few impertinent hall terrorists." 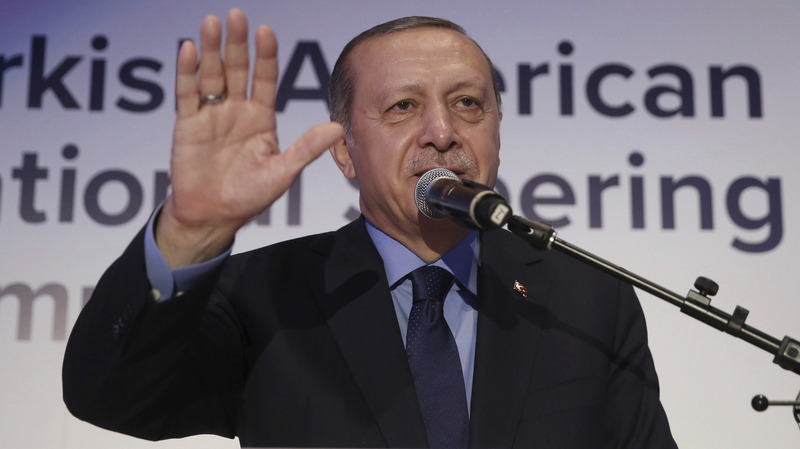 When Erdogan visited Washington, D.C., in May, protesters gathered at the ambassador's residence, and the situation devolved into an altercation with the Turkish leader's bodyguards — who were seen on video pushing past D.C. police to attack protesters, nine of whom were left injured. In June, Washington's Metropolitan Police issued 18 arrest warrants over the incident. The list of suspects included 12 Turkish security officials.